Once or twice a year our neighborhood has a community-wide parking lot sale. It’s like a garage sale for HOA people who are afraid to have strangers paw through their junk in a driveway. Oh, if they only knew how we paw through their junk at the curb on trash day! 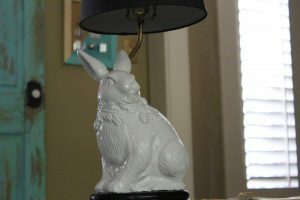 At the latest sanitized resale extravaganza, Landon picked up a ceramic bunny lamp for $3. 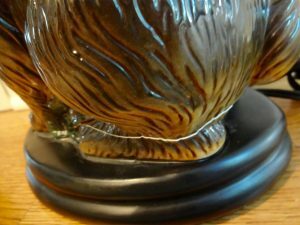 She was asking $5, but Landon pointed out that it was cracked all the way around the base and the bunny’s ear had been re attached with Superglue. We drive a hard bargain around here! Within five minutes of getting it home, Landon had snapped some before pictures and taken off the shade to be dropped off at Goodwill. 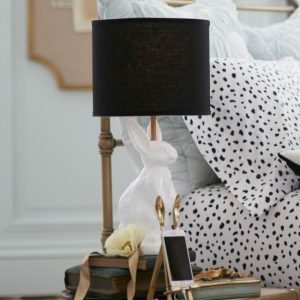 We’re not sure what that shade was made from, but it had that waxy mesh feel of outdoor patio cushions. He then taped off the base and the gold pole and put the cord in a plastic grocery bag to prevent it from being spray painted. 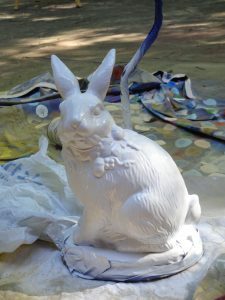 He lightly sanded the bunny, which looks way better in the Before photos than it looked in real life. 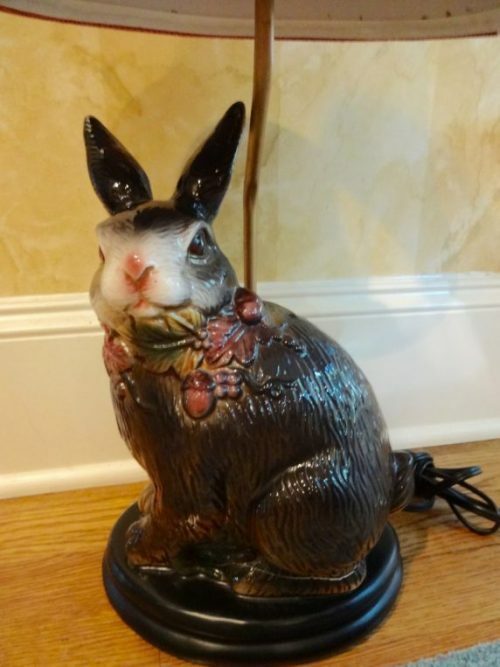 The camera kept correcting the creepy red eyes, which appeared to be a bad case of ceramic bunny conjunctivitis. 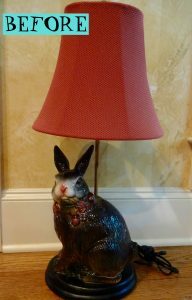 Since there was not a Visine for that, the bunny had to have a complete makeover. 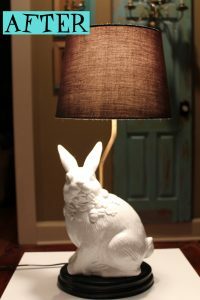 Inspired by The Emily & Meritt White Bunny Table Lamp from Pottery Barn, Landon gave it two coats of glossy white spray paint. But not just any spray paint! He gave it two coats of the most magnificent spray paint on the planet–Rustoleum Gloss Protective Enamel.